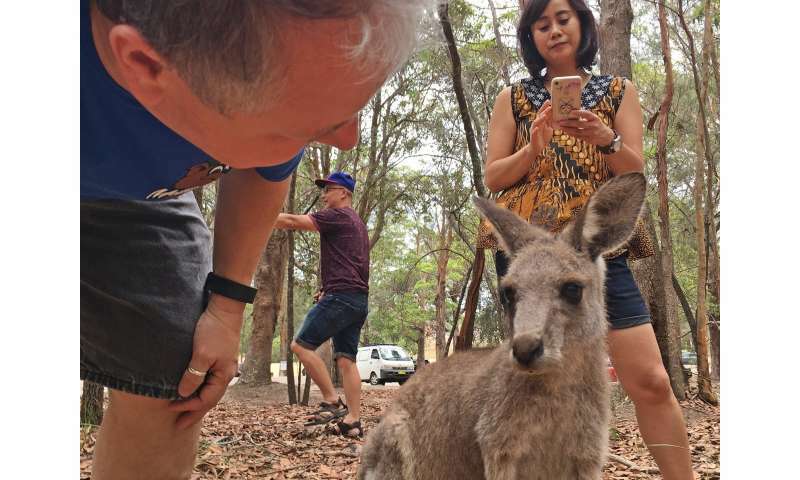 The phenomenon of kangaroo selfies hit the headlines earlier this month, when several tourists were injured while feeding wild kangaroos in Lake Macquarie, north of Sydney. They may have wanted a memorable holiday snap, but ended up with rather more than they bargained for. One news report described how the "cute and cuddly" animals had begun "viciously attacking people". Is that really fair on the kangaroos? Of all the adjectives you could use to describe an animal that is territorial, fiercely maternal and has large claws, "cuddly" is pretty far down the list. The problem with that description of the incident is that it suggests that the kangaroos were to blame for the injuries. In reality, it was the fault of the people getting too close and offering them the wrong food. Having become so used to being handed carrots, we can hardly blame the kangaroos for being "hopped up", as the news coverage punningly put it. In India, another recent case ended in tragedy when a man attempted to take a selfie with a bear. The man reportedly turned his back on the bear and was then mauled to death. The growing danger of animal selfies, and of feeding wild animals, is well documented. People have been killed and injured by tigers, such as in the case of a zoo visitor in India who climbed over a safety barrier in search of a better photo. Wild long-tailed macaques at Bali's Uluwatu Temple have got so used to being fed that they steal tourists' valuables and only drop them when given snacks. A 2016 study in the Journal of Travel Medicine recommended that: "…scenarios where selfies should be avoided include photographs taken from a height, on a bridge, in the vicinity of vehicular traffic, during thunderstorms, at sporting events, and where wild animals are in the background." Interacting with wild animals isn't just dangerous for people. It can be bad news for the animals too. A 2017 study looked specifically at kangaroos who are exposed to wildlife tours. It concluded that both wild and captive kangaroos can be stressed by humans approaching them closely, and that the presence of tourists may drive them away from feeding, breeding or resting areas. It also noted that the potential knock-on effects for kangaroo population numbers are still unknown. A review in the journal Tourism Management, written after a nine-year-old boy was killed by dingoes on Queensland's Fraser Island in 2001, confirmed that routinely feeding wild animals can alter their behaviour patterns and population levels. There was no suggestion that the boy was engaging in risky behaviour, but rather that the dingoes had become dangerously habituated to human presence, as a result of previous feeding by tourists and easy access to campsite food. You might shake your head in disbelief at the idea of turning your back on a wild bear in search of the perfect selfie. But how many of you have taken a photo with an animal and posted it on social media? These photographs, even if they are of habituated animals in urban areas or in a zoo, can endanger wild animals and cause them undue stress (as discussed in a previous article). Taking a selfie of a zoo animal can leave the impression that kangaroos, koalas and other "fluffy" animals act like this in the wild. People who don't know about the normal behaviour of these animals may therefore think that these animals are OK to approach in the wild. This could explain why so many tourists still consider it safe to approach wild kangaroos. While some wild animals are undoubtedly cute, we should be sensible enough not to expect them to be cuddly. We need to respect wild animals' behaviour and territories, so as to avoid injury and live in harmony. Zoos in Australia generally house hand-reared animals, many of which are used to being fed and petted by people in a safe and monitored environment. The animals are given carefully selected diets, as well as places to which they can retreat if they have had enough interaction. All of this helps to minimise the stress on the animals and the risk to people. And of course, there is the broader point that zoo animals deserve respect and are not just cuddly toys. Just because you can pat and feed a kangaroo at a zoo, does not mean you can do it elsewhere. Zoos can play their part by promoting advice about safe behaviour around wild animals elsewhere. So next time you're lucky enough to see kangaroos or another animal in the wild, by all means take a photo—if you can do it from a safe distance. And ask yourself whether you really need to be in it too.